The euro again has grown against the dollar. The GDP growth in the 3rd quarter amounted to + 0.1% q/q after a reduction of 0.1% m/m in the 2nd quarter. In the annual comparison the indicator recorded + 1.2% y/y. We expect the Germany import price index as it reflects the inflation situation and the consumer sentiment data in Italy and France. We expect the Germany import prices with decrease -0.3% m/m, -1.5% y/y, the Italians sentiment with a growth, but the French sentiment unchanged. During the euro/dollar declining to the 24th figure we observed the profit-taking fixation on the short positions that led to the pair rebound to the level of 1.2500. Taking into consideration the dollar overbought the pair may grow above the 25th figure in the short term. 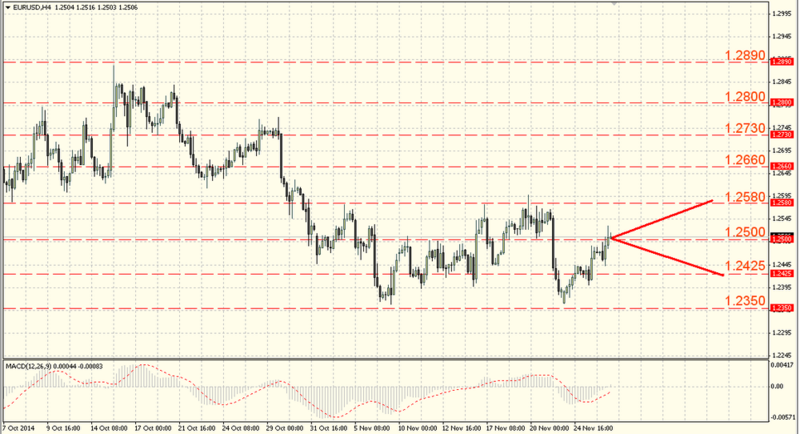 Its consolidation will lead to its increase to the resistance near 1.2580-1.2600. The British pound traded against the US dollar in the narrow side range. The UK news publish the adjusted GDP data for the third quarter, we do not expect changes and it will likely remain + 0.7% q/q and + 3.0% y/y as it was announced earlier. The Confederation of British Industry (CBI) retail sales report will be released, we expect the indicator to decrease to 28 from 31 previously. The British pound rose against the US dollar after the support level of 1.5630-1.5650 testing. It broke through. 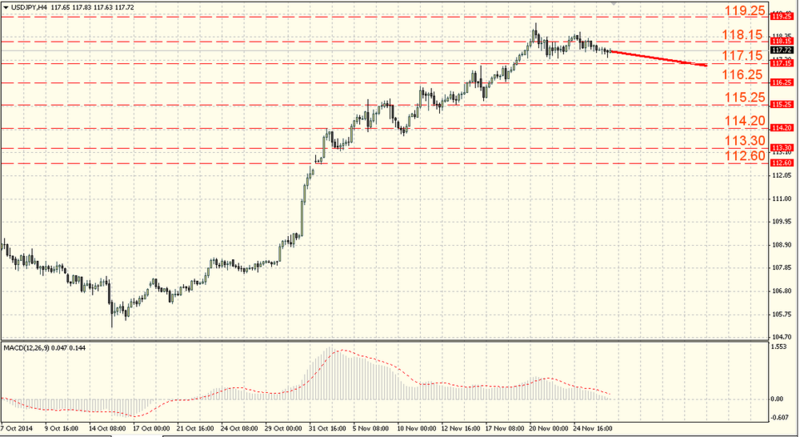 The resistance level of 1.5730-2.5750 and tested the mark of 1.5800-1.5820. 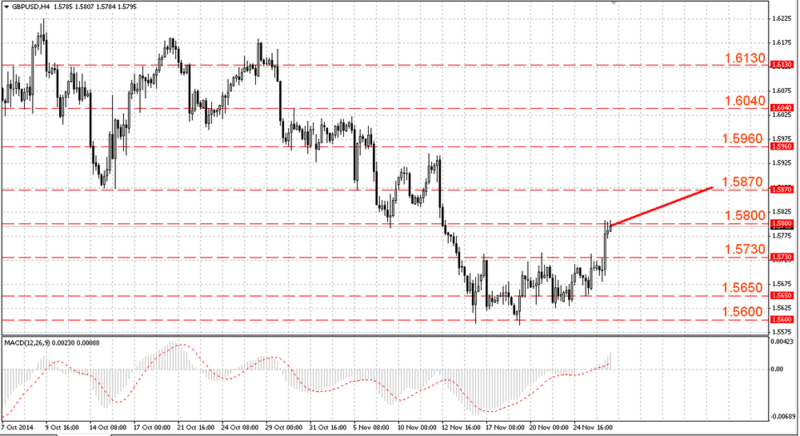 The pair needs to overcome the resistance level of 1.5800-1.5820 to continue its recovery. Its breakthrough will weaken the downward pressure. The range trading within the pair dollar/yen ended with the US dollar slight decrease. Probably, the investors’ pessimism is caused by the events in the US debt market where we observe the steady “Treasuries” profitability decline for several sessions. The Japan small business confidence indicator publication showed a slight increase in November, 47.7 vs. 47.4 previously. It is still not possible to resume the dollar growth against the yen. The short-term profit-taking fixation by the traders puts pressure on the dollar, because of it the dollar fell below the level of 117.95-118.15. It is possible the pair decrease to the current lows of 116.95-117.15. The oversold USD/JPY can lead to a deeper correction, but we should not talk about the top formation and the end of the uptrend.